TSP Legal > News > Community News > Let Them Eat Cake! And Savoury Too! Let Them Eat Cake! And Savoury Too! Now that the Great British Bake–off is over for another year it is time for the Great TSP Bake-off in aid of Breakthrough Breast Cancer to take place. 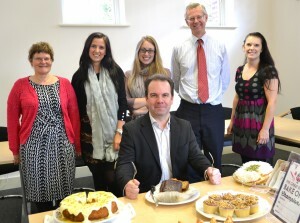 Seven budding TSP bakers entered their cakes and savouries into the competition, which was judged by TSP’s very own “Mr Hollywood”, Chief Operating Officer, Sean Stuttaford. The winning entry, a banana and sultana cake with cream cheese frosting, was baked by Wills and Estates Legal Secretary Emma Cherry, with the cheese and bacon savouries served up by IT’s Juliette Morris coming a very close second. 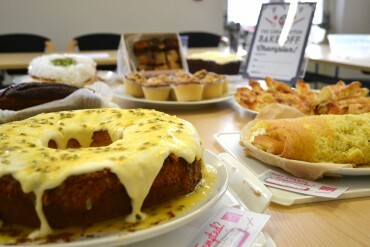 “Contestants” paid £1 to enter their cake and TSP staff paid £1 to eat cake! A grand total of £68 was raised for this very good cause. Thanks to everyone who baked and everyone who ate! Breakthrough Breast Cancer brings thousands of people across the UK together in a common aim – to stop women dying from breast cancer. They hope to achieve this by finding new treatments, discovering the causes, promoting early detection and ensuring the best possible care for women diagnosed with the disease. To find out more about Breakthrough Breast Cancer click here. TSP was also pleased to be able to support friend of the firm Matt Swain who cycled from London to Berlin in aid of Breast Cancer Care on 4 October 2014. Before the ride Matt said “I shall be wearing a large pink bra and have yet to decide which is more daunting; the 600 miles or the apparel. 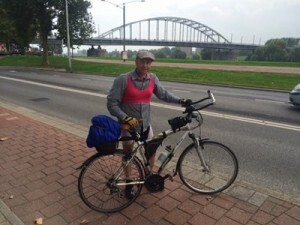 Some farmers are joining me for the London leg then an old friend the rest.” Matt is pictured in Arnhem with his bike and his bra. If you would like to support Matt in his fundraising you can visit his Just Giving page here.